Karl Wilhelm Friedrich (after 1814: von) Schlegel (/ˈʃleɪɡəl/; German: [ˈfʁiːdʁɪç ˈʃleːgl̩]; 10 March 1772 – 12 January 1829), usually cited as Friedrich Schlegel, was a German poet, literary critic, philosopher, philologist and Indologist. With his older brother, August Wilhelm Schlegel, he was one of the main figures of the Jena romantics. He was a zealous promoter of the Romantic movement and inspired Samuel Taylor Coleridge, Adam Mickiewicz and Kazimierz Brodziński. The first to notice what became known as Grimm's law, Schlegel was a pioneer in Indo-European studies, comparative linguistics, and morphological typology. As a young man he was an atheist, a radical, and an individualist. In 1808, the same Schlegel converted to Catholicism. Two years later he was a diplomat and journalist in the service of the reactionary Clemens von Metternich, surrounded by monks and pious men of society. Karl Friedrich von Schlegel was born on 10 March 1772 at Hanover, where his father, Johann Adolf Schlegel, was the pastor at the Lutheran Market Church. For two years he studied law at Göttingen and Leipzig, and he met with Friedrich Schiller. In 1793 he devoted himself entirely to literary work. In 1796 he moved to Jena, where his brother August Wilhelm lived, and here he collaborated with Novalis, Ludwig Tieck, Fichte, and Caroline Schelling, who married August Wilhelm. Novalis and Schlegel had a famous conversation about German idealism. In 1797 he quarreled with Schiller, who did not like his polemic work. Schlegel published Die Griechen und Römer (The Greeks and Romans), which was followed by Geschichte der Poesie der Griechen und Römer (History of the Poesy of the Greeks and Romans) (1798). Then he turned to Dante, Goethe, and Shakespeare. In Jena he and his brother founded the journal Athenaeum, contributing fragments, aphorisms, and essays in which the principles of the Romantic school are most definitely stated. They are now generally recognized as the deepest and most significant expressions of the subjective idealism of the early Romanticists. After a controversy, Friedrich decided to move to Berlin. There he lived with Friedrich Schleiermacher and met Henriette Herz, Rahel Varnhagen, and his future wife, Dorothea Veit, a daughter of Moses Mendelssohn and the mother of Johannes and Philipp Veit. In 1799 he published Lucinde, an eccentric and unfinished novel, which is remarkable as an attempt to transfer to practical ethics the Romantic demand for complete individual freedom. Lucinde, in which he extolled the union of sensual and spiritual love as an allegory of the divine cosmic Eros, caused a great scandal by its manifest autobiographical character, mirroring his liaison with Dorothea Veit, and it contributed to the failure of his academic career in Jena  where he completed his studies in 1801 and lectured as a Privatdozent on transcendental philosophy. In September 1800 he met four times with Goethe, who would later stage his tragedy Alarcos (1802) in Weimar, albeit with a notable lack of success. In June 1802 he arrived in Paris, where he lived in the house formerly owned by Baron d'Holbach and joined a circle including Heinrich Christoph Kolbe. He lectured on philosophy in private courses for Sulpiz Boisserée, and under the tutelage of Antoine-Léonard de Chézy and linguist Alexander Hamilton he continued to study Sanskrit and the Persian language. He edited the journal Europa (1803), where he published essays about Gothic architecture and the Old Masters. In April 1804 he married Dorothea Veit in the Swedish embassy in Paris, after she had undergone the requisite conversion from Judaism to Protestantism. In 1806 he and his wife went to visit Aubergenville, where his brother lived with Madame de Staël. In 1808 he published an epoch-making book, Über die Sprache und Weisheit der Indier (On the Language and Wisdom of India). Here he advanced his ideas about religion and importantly argued that a people originating from India were the founders of the first European civilizations. Schlegel compared Sanskrit with Latin, Greek, Persian and German, noting many similarities in vocabulary and grammar. The assertion of the common features of these languages is now generally accepted, albeit with significant revisions. There is less agreement about the geographic region where these precursors settled, although the Out-of-India model has generally become discredited. In 1808, he and his wife joined the Roman Catholic Church in the Cologne Cathedral. From this time on, he became more and more opposed to the principles of political and religious freedom. He went to Vienna and in 1809 was appointed imperial court secretary at the military headquarters, editing the army newspaper and issuing fiery proclamations against Napoleon. He accompanied archduke Charles, Duke of Teschen to war and was stationed in Pest during the War of the Fifth Coalition. Here he studied the Hungarian language. Meanwhile he had published his collected Geschichte (Histories) (1809) and two series of lectures, Über die neuere Geschichte (On Recent History) (1811) and Geschichte der alten und neuen Literatur (On Old and New Literature) (1815). In 1814 he was knighted in the Supreme Order of Christ. Following the Congress of Vienna (1815), he was councilor of legation in the Austrian embassy at the Frankfurt Diet, but in 1818 he returned to Vienna. In 1819 he and Clemens Brentano made a trip to Rome, in the company of Metternich and Gentz. There he met with his wife and her sons. In 1820 he started a conservative Catholic magazine, Concordia (1820–1823), but was criticized by Metternich and by his brother August Wilhelm, then professor of Indology in Bonn and busy publishing the Bhagavad Gita. Schlegel began the issue of his Sämtliche Werke (Collected Works). He also delivered lectures, which were republished in his Philosophie des Lebens (Philosophy of Life) (1828) and in his Philosophie der Geschichte (Philosophy of History) (1829). He died on 12 January 1829 at Dresden, while preparing a series of lectures. 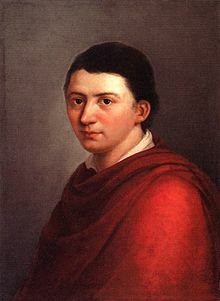 Friedrich Schlegel's wife, Dorothea von Schlegel, authored an unfinished romance, Florentin (1802), a Sammlung romantischer Dichtungen des Mittelalters (Collection of Romantic Poems of the Middle Ages) (2 vols., 1804), a version of Lother und Maller (1805), and a translation of Madame de Staël's Corinne (1807–1808) — all of which were issued under her husband's name. By her first marriage she had two sons, Johannes and Philipp Veit, who became eminent Catholic painters. Friedrich Schlegel and his brother August Wilhelm occupy canonical positions in the history of German literature as the critical leaders of the Romantic school, which derived from them most of its governing ideas concerning the characteristics of the Middle Ages and the methods of literary expression. Of the two Schlegel brothers, Friedrich was unquestionably the more brilliant and original. He was the real founder of the Romantic school; to him more than to any other member of the school we owe the revolutionizing and germinating ideas which influenced so profoundly the development of German literature at the beginning of the 19th century. Schlegel stated that his goal was a unified representation of philosophy, prose, poesy, genius, and critique. Key elements were his conceptions of a "progressive universal poesy", romantic irony, and a new mythology. Friedrich Schlegel's Sämtliche Werke appeared in 10 vols. (1822–1825); a second edition (1846) in 55 vols. His Prosaische Jugendschriften (1794–1802) have been edited by J. Minor (1882, 2nd ed. 1906); there are also reprints of Lucinde, and F. Schleiermacher's Vertraute Briefe über Lucinde, 1800 (1907). See R. Haym, Die romantische Schule (1870); I. Rouge, F. Schlegel et la genie du romantisme allemand (1904); by the same, Erläuterungen zu F. Schlegels „Lucinde“ (1905); M. Joachimi, Die Weltanschauung der Romantik (1905); W. Glawe, Die Religion F. Schlegels (1906); E. Kircher, Philosophie der Romantik (1906); M. Frank "Unendliche Annäherung". Die Anfänge der philosophischen Frühromantik (1997); Andrew Bowie, From Romanticism to Critical Theory: The Philosophy of German Literary Theory (1997). ^ Frederick C. Beiser, German Idealism: The Struggle Against Subjectivism, 1781-1801, Harvard University Press, 2002, p. 349. ^ a b Asko Nivala, The Romantic Idea of the Golden Age in Friedrich Schlegel's Philosophy of History, Routledge, 2017, p. 23. ^ a b Brian Leiter, Michael Rosen (eds. ), The Oxford Handbook of Continental Philosophy, Oxford University Press, 2007, p. 175: "[The word 'historicism'] appears as early as the late eighteenth century in the writings of the German romantics, who used it in a neutral sense. In 1797 Friedrich Schlegel used 'historicism' to refer to a philosophy that stresses the importance of history..."; Katherine Harloe, Neville Morley (eds. ), Thucydides and the Modern World: Reception, Reinterpretation and Influence from the Renaissance to the Present, Cambridge University Press, 2012, p. 81: "Already in Friedrich Schlegel's Fragments about Poetry and Literature (a collection of notes attributed to 1797), the word Historismus occurs five times." ^ Angela Esterhammer (ed. ), Romantic Poetry, Volume 7, John Benjamins Publishing, 2002, p. 491. ^ Michael N. Forster, Kristin Gjesdal (eds. ), The Oxford Handbook of German Philosophy in the Nineteenth Century, Oxford University Press, 2015, p. 81. ^ "Friedrich - Französisch-Übersetzung - Langenscheidt Deutsch-Französisch Wörterbuch" (in German and French). Langenscheidt. Retrieved 20 October 2018. ^ "Duden | Schlegel | Rechtschreibung, Bedeutung, Definition". Duden (in German). Retrieved 20 October 2018. ^ a b Speight (, Allen 2007). "Friedrich Schlegel". In Zalta, Edward N. (ed.). Stanford Encyclopedia of Philosophy. .
^ Ernst Behler, German Romantic Literary Theory, 1993, p. 36. ^ a b This article incorporates text from a publication now in the public domain: Böhme, Traugott (1920). "Schlegel, Karl Wilhelm Friedrich von" . In Rines, George Edwin (ed.). Encyclopedia Americana. ^ This article incorporates text from a publication now in the public domain: Chisholm, Hugh, ed. (1911). "Schlegel, Karl Wilhelm Friedrich von" . Encyclopædia Britannica (11th ed.). Cambridge University Press. ^ Adam Zamoyski (2007), Rites of Peace: The Fall of Napoleon and the Congress of Vienna, pp. 242–243. Wikimedia Commons has media related to Friedrich Schlegel. "Schlegel, Friedrich von" . New International Encyclopedia. 1905. "Schlegel, Friedrich von" . The Nuttall Encyclopædia. 1907. "Friedrich von Schlegel" . Catholic Encyclopedia. 1913. "Schlegel, Friedrich von" . Collier's New Encyclopedia. 1921. "Works by Friedrich Schlegel". Zeno.org (in German). "Friedrich Schlegel". Biographisch-Bibliographisches Kirchenlexikon (BBKL) (in German). This page was last edited on 9 February 2019, at 17:27 (UTC).